Dark delight. 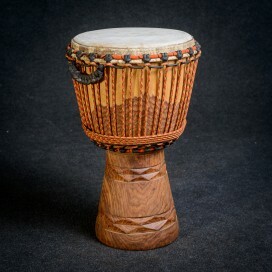 This professional djembe drum is made from noble red mahagon wood Diala. Perfect tone and slap distinction. Very strong and clear sound. Awesome carvings. Brand new criss-cross hitches design on the bottom ring. Well done skin over with hair. Delicate issue..